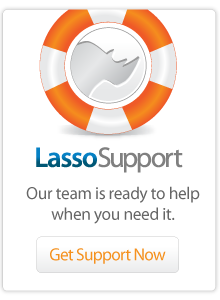 Choose the Lasso product you wish to download for detailed instructions and the most up-to-date links. Download for FREE and run in developer mode*, or buy a license to deploy its full capabilities. Lasso Professional 8 is a scriptable Web application server with a powerful tag-based language called LassoScript. Custom solutions can be created by following the instructions contained in the Lasso Language guides. Available for Windows, Mac, and Linux. Our flagship product is all any developer needs to create dynamic, far-reaching applications that manage data flow between tables and the web. Available for Windows, Mac and Linux. * developer mode is limited to 5 IPs and 200 connections per minute.